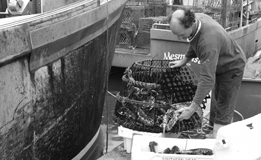 In the 1880's Sussex fishermen were said to be of 'strong and resolute stock'. Mainly a mixed race, partly Spanish partly Norman French and partly Saxon in origin. The 'Willicks' or 'Willickers', as the Fishermen of Eastbourne were known of old, would fish the herring, sprat and mackerel when they came round in their seasons from the North. In their sturdy sailing luggers known as 'Bourners', along with the fishing fleets of Hastings and Brighton, the Eastbourne fishermen would follow the mackerel down the English channel to Devon and Cornwall and, often as far as the waters off Southern Ireland, being away for months during the season. Other fishing expeditions would take the Eastbourne luggers to northern waters off of the east coast as far away as Scarborough. This close-knit community possessed skills and knowledge in the ways of the sea acquired over many generations of hardship with a mixture of bravery and tragedy both at sea and ashore. There are approximately 30 to 40 family owned fishing boats operating out of Eastbourne's Sovereign Harbour, this number does fluctuate up and down on a regular basis. Most of the boats are classed as 'small' fishing boats with most being under 10m in length. Nearly all the boats are running and operating completely static fishing gear (static nets and pots etc and not beam or net trawling). 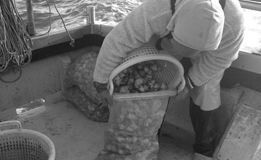 This method of fishing is classified as 'low impact' fishing with low environmental damage and has created an extremely successful and stable local industry which can be built-on in the future. The fish and shell-fish landed by the Eastbourne fishing fleet is of a consistently high quality and it is usually, caught, landed and sold on the same day, a great deal of the catch is sold locally and because of the quality, a high proportion is exported to some of the best restaurants in Europe.